Okdo Ppt Pptx to Pdf Converter a powerful ppt/pptx to pdf converter which provides an easy method for you Own it, you can batch convert your ppt/pptx format to your personal and searchable PDF. The speed is super fast, the quality is super good. The output PDF quality is super high with preserving the original text, tables, image, layout of your file. Output PDF by three ways: default way, image way, text way. 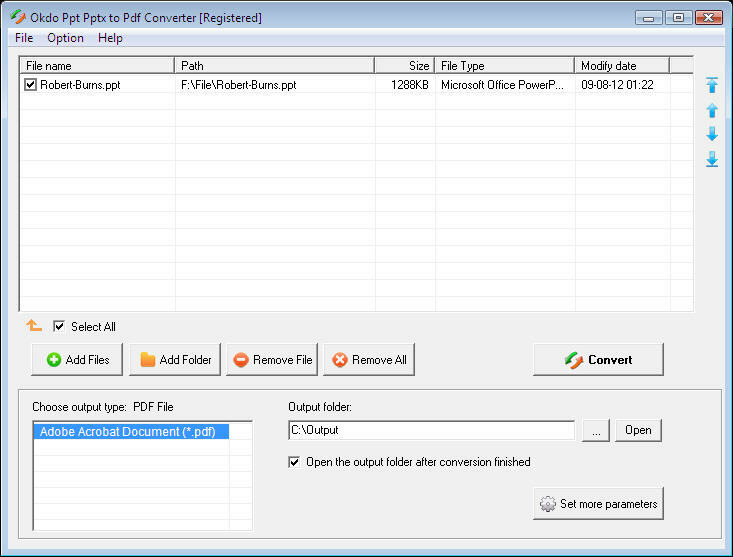 Batch convert ppt/pptx format file to your searchable pdf with fast speed. ...... The output PDF quality is super high with preserving the original text, tables, image, layout of your file. * Okdo Ppt Pptx to Pdf Converter is a standalone program which does not need Adobe Acrobat software support. * Convert massive ppt pptx format files to PDF once to save your time. * Output PDF by three ways: default way, image way, text way. * Support add the watermark to the converted PDF file. * Convert one multi-page PowerPoint file to one multi-page PDF. * Convert each lantern slide of PowerPoint to one single PDF. * Custom to set the output PDF password for protection by user password, owner password. * Set the page margin as you need. * Adjust the image size to the PDF page size. * Custom to set the output file name. * Save List: Save the converted files to a list. * Load List: Load the saved list files directly to convert. Qweas is providing links to Okdo Ppt Pptx to Pdf Converter 4.6 as a courtesy, and makes no representations regarding Okdo Ppt Pptx to Pdf Converter or any other applications or any information related thereto. Any questions, complaints or claims regarding this application Okdo Ppt Pptx to Pdf Converter 4.6 must be directed to the appropriate software vendor. You may click the publisher link of Okdo Ppt Pptx to Pdf Converter on the top of this page to get more details about the vendor.